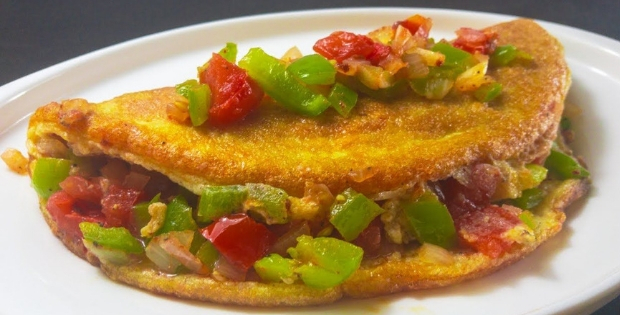 A good omelette absolutely hits the spot for any meal of the day – breakfast, lunch or dinner. It’s filling, satisfying, and absolutely rich in taste! This vegan Mexican version of an omelette is sure to spice up your mealtime! Tofu and potatoes provide a sturdy base, while nutritional yeast and spices add loads of flavor! This recipe is chock-full of essential nutrients like proteins and vitamin-rich veggies, without compromising on taste! If you are looking for more recipes that will blow your tastebuds away, but are still good for your health, Download The Complete Vegan Recipe Solution. In a small saucepan, sauté the onion in oil. When softened, add the peppers; then the diced tomatoes. Add chili / Mexican spice seasonings and Bragg’s with the tomato paste, sea salt and paprika. Cook until veggies are tender and flavors blend, about 10-15 minutes. Set this sauce aside. and nutritional yeast. Add cooked potato to mashed tofu and mix well. Batter should be firm. enough oil to cover the bottom completely. Fry the tofu batter. Flip while cooking (in sections) so it cooks all the way through and then press back together and continue cooking until browned and formed into an omelette shape. Allow to cool somewhat and solidify before flipping onto a serving plate. Warm the sauce and spread on top of tofu. Serve immediately. 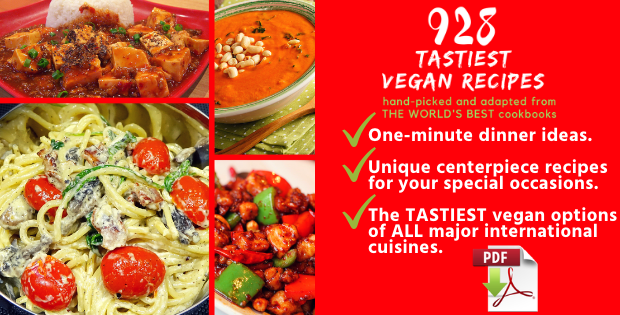 This recipe is one of 928 Tastiest Vegan Recipes From Around The World, which you can Download Here.